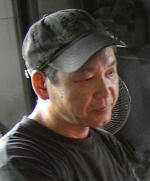 Knifesmith Hideo Kitaoka in Takefu, Fukui Province, Japan, specializes in the forging of very high quality kitchen knives. The cutting edges of his knives are forged from "white paper steel", a high-carbon steel that is very hard, but not as brittle as most steels of this type. This layer of white paper steel is forged to one or two laminates of softer and tougher many-layered Damascus steel, called "Suminagashi" in Japanese, to give strength, and beauty, to the finished blade. The hardness of the white paper steel is over 60 HRC. Takefu has been a center of the art of metal working for more than 700 years. This long tradition grew from deposits of iron ore in Chino mountain, and iron sand found in Chino river, both near Takefu. The iron in the Chino river is still mined in some places for special applications in small quantities. Takefu merged with the City Imadate on October 1, 2005. The new name of this conglomeration is "Echizen City". This is a reminiscence to the historic province of Echizen which is today the northern part of Fukui prefecture. Have a look at these pictures from Kitaoka’s smithy, and you can also enjoy the Video. Steel is heated in the furnace. 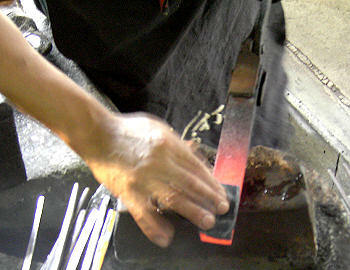 Forging the hagane, the cutting laminate of these knives, with a spring hammer. 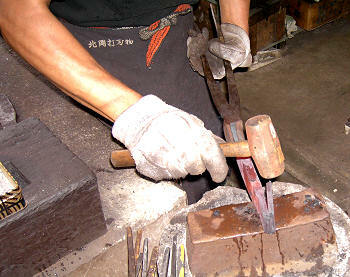 The spring hammer is also used to cut the steel into pieces of the proper size to forge into the hagane layer. The pieces have been cut with the hammer. The hagane will be hammer-welded to one or two layers of softer, stronger, Damascus steel. Kitaoka applies a special powder, made of borax and other, secret, ingredients to help weld the layers together. 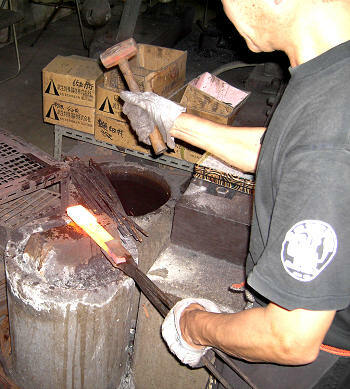 After reheating the metal in the furnace, Kitaoka will forge the layers together by hand. 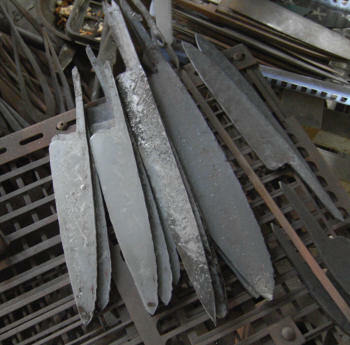 After raw forging, the blade blanks are ready to be ground, sharpened and finished. The video’s file size is about 35 MB. Click to watch the video only if you have a DSL or other broadband internet connection. The Windows Media Player film takes about 3 minutes to load before it runs (Watch for the notice, "Download is complete.") The film is just under two minutes long and is copyright protected. It shows Master Smith Kitaoka at work. 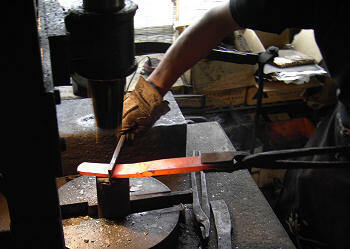 The film begins with the forging of the white paper steel with the spring hammer. This hammer is then used to cut the raw hagane steel blank (the inner, cutting edge, lamination) into pieces of the right size to be forged into a knife. 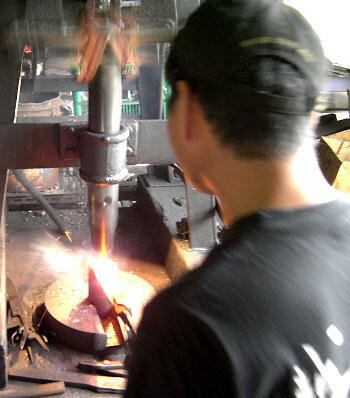 Kitaoka then prepares a piece of hagane to be forged to a layer of the Damascus steel. He puts a powder, borax and other, secret, ingredients, onto a piece of the Damascus steel in the area where the hagane steel will be placed. The borax powder acts as a flux material to dissolve any oxide films that might possibly develop and prevent a strong bond. 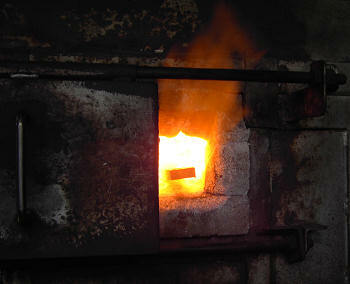 At the end, he puts the two pieces into the furnace together to heat them together for the forging.